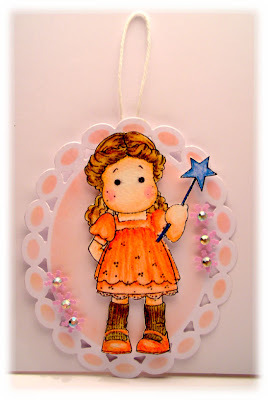 Magnolia Tilda, watercolour pencils, TH Spun Sugar distress ink, bling, Spellbinder Label 4 dies, snowflake punch. Hi ! This is a very beautiful tag for our challenge ! Great colorouring too.... Thanks for joining us at DML. Christa. A gorgeous decoration, beautiful work. Thanks for joining us this week at TOMIC. Very nice tag! Thanks for joining us at Magnolia-licious.